Is the ivory-billed woodpecker dead or alive? 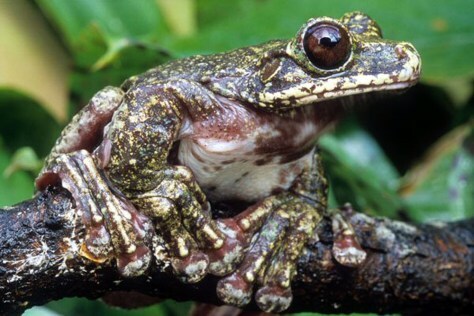 The Rabb's fringe-limbed tree frog, shown here, is one of 17,291 species threatened with extinction, according to an assessment of 47,677 animals and plants by the International Union for Conservation of Nature. The frog is found only in the mountains surrounding the town of El Valle de Anton in central Panama. Deforestation and a fungal disease are blamed for its decline. Only one male has been heard calling in the wild since 2006, and captive breeding efforts have so far proven unsuccessful, according to the IUCN's "Red List of Threatened Species." Many conservationists say an extinction crisis is under way, driven by factors that range from overfishing and forest clear-cutting to global climate change. Amid all this doom and gloom, however, a bit of fleeting good news appears every now and again, when a species thought gone for good surprisingly reappears. Click the "Next" button to learn eight of these stories. The endings may not be happy, but at least their stories are not yet over. 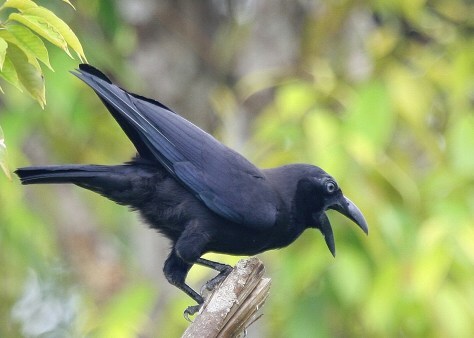 A crow known to science only by two specimens described in 1900 and long thought extinct has reappeared on a remote, mountainous Indonesian island. Rediscovery of the Banggai crow was confirmed by a zoologist at Michigan State University, who compared two birds secured in 2007 on Peleng Island with the two preserved specimens at the American Museum of Natural History in New York. Distinctive eye coloration differentiates the species from the similar slender-billed crow, which also flutters around Indonesia. The IUCN lists the Banggai crow as critically endangered due to its scant population and increased rates of logging on Peleng Island. Conservation actions include a campaign to prevent local hunting of the bird and protection of its remaining forest habitat through sustainable agriculture initiatives. The agricultural measures would reduce the need to clear more trees to plant crops. Many Asian turtles, including the Arakan forest turtle, are popular food items, and human appetites are driving several toward extinction. 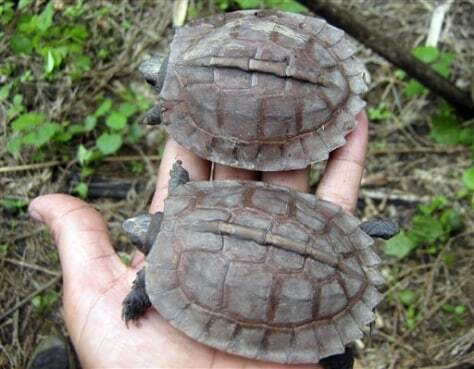 The five Arakan forest turtles found in the wildlife sanctuary are the first wild specimens seen since 1908. Scientists with the New York-based Wildlife Conservation Society are encouraging beefed-up security at the sanctuary to help protect the species, which is listed as critically endangered by the IUCN. A primate that looks like a shrunken version of the popular Furby electronic toy has shown up on a mountain in Sulawesi, Indonesia. Several scientists had given up on the pygmy tarsiers. Then a dead specimen was found in a rat trap in 2000, which sent Texas A&M anthropologist Sharon Gursky-Doyen sleuthing. She trapped, tagged and tracked three specimens in the summer of 2008, confirming that the pint-sized primates really do still exist. The IUCN lists pygmy tarsiers as data deficient since so little is known about the species. Gursky-Doyen and her colleagues hope the rediscovery will put pressure on the Indonesian government to protect the primate's habitat within Lore Lindu National Park. About 60 villages are inside the 2,000-square-kilometer park's boundaries and are encroaching on the Furby-like critter's mountain habitat. Beck's petrel, a seabird not seen since the 1920s, was recently rediscovered in a group of islands northeast of Papua New Guinea. The hard evidence for the bird's existence came from photographs of more than 30 of them taken by Israeli ornithologist Hadoram Shirihai, who led an expedition to the Bismarck Archipelago to find the dark brown birds with pale bellies and tubelike noses. 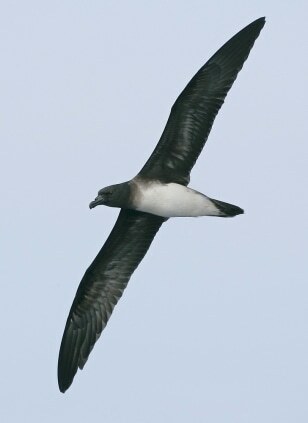 The IUCN lists the Beck's petrel as critically endangered. Though the exact whereabouts of its breeding grounds are unknown, conservationists are concerned that introduced rats and cats could be preying on the birds. Conservationists plan to scour the region, including far-flung atolls, to get a firmer grasp on the bird's status. A small population of 1.5-inch-long Armoured Mistfrogs appears to have been skipped over by the devastating chytrid fungus in the rainforests of northwestern Australia. The sighting of several dozen frogs in 2008 was the first since 1991. Most researchers believed the fungus, which has taken a grim toll on frogs all over the world, had wiped out the Armoured Mistfrog. 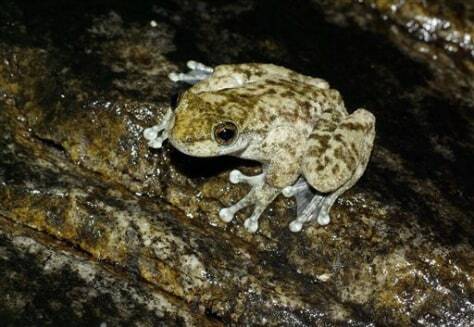 The light brown frogs with dark brown spots are listed by the IUCN as critically endangered. The fungus is considered the main threat to the frogs, which live in an area that has been protected since 1988, according to the environmental organization. A little-known wetland bird, not seen since it was discovered in 1867 in the Sutlej Valley of India, showed up more than 1,900 miles away at a wastewater treatment plant outside of Bangkok, Thailand, in 2006. 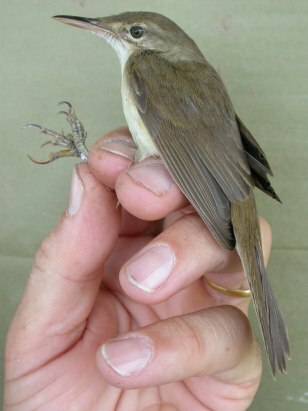 The finding of the large-billed reed warbler was confirmed with DNA tests. Six months later, another specimen of the species was found mislabeled in a drawer at a natural history museum in Tring, England. The IUCN lists the bird as data deficient, saying that "it may be genuinely rare, but it is possible a substantial population exists and has been overlooked due to its similarity to" other reed warblers. Although little is known about the large-billed reed-warbler, scientists think the one seen in Thailand was unusual. The bird is better known in India. A critically endangered turtle that scientists thought was extinct in the wild was found swimming in a northern Vietnam lake. The Swinhoe's soft-shell turtle is the only known specimen in the wild. Elated researchers with the Cleveland Metroparks Zoo, which sponsored the expedition to find the turtle, experienced a bit of pre-Thanksgiving heartburn in 2008 when the reptile got swept away in a flood and fell over a dam. A local fisherman caught it and almost gave in to thousand-dollar offers to sell it to soup makers, but conservationists persuaded him to return it to the lake. The IUCN lists the turtle as critically endangered. The species' demise is primarily due to hunters who trapped and killed the creatures for food and to make traditional medicines from their bones, according to the Cleveland zoo. Loss of habitat along major rivers and pollution are also to blame. 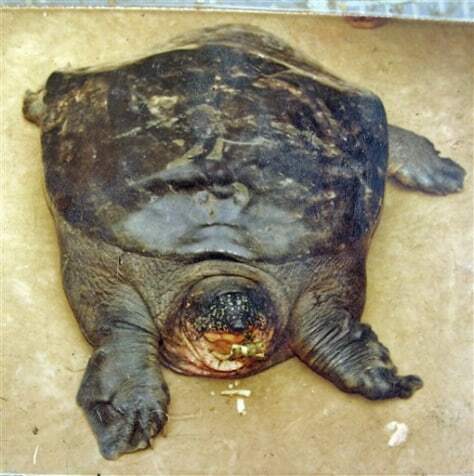 The Swinhoe's soft-shell turtle is the largest freshwater turtle in the world. They weigh up to 300 pounds, measure up to 3 feet in length and live more than 100 years. Birdwatchers around the world were atwitter when scientists announced in April 2005 that the ivory-billed woodpecker, last seen in 1944, was alive and well in an Arkansas swamp. Since then, experts have searched through swampy forests in the southeastern U.S., hoping to confirm the elusive bird's existence, but they’ve turned up empty-handed. A few birds may still be holding out in nearly impenetrable swamplands, but in 2009 scientists with the Cornell Lab of Ornithology ended five years of grueling searches with no success. Conservationists are also encouraging searches in Cuba, where a population may remain. 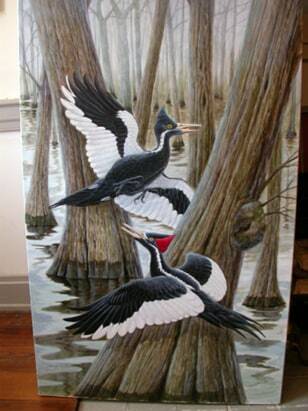 The IUCN lists the ivory-billed woodpecker as critically endangered.